Can you believe that Christmas is just one week from today? As the saying goes, it’s a wonderful time of the year. Those who are organized and on track with their preparations can relax and enjoy the holiday. Is that you? For most people, holiday time means A LOT of work and s-t-r-e-s-s. Shopping, cooking, cleaning, traveling, schlepping. There is time to do what you need to do (or at least most of it). Stay positive and refuse to let anything ruin your holiday cheer! Here are 9 time-saving, overwhelm-reducing survival tips for before, during and after the holiday. Delegate whatever you can. Ask for help. Let others share in preparing a delicious holiday meal. If you’re hosting or bringing a dish to share and time is short, accept that you only can do so much. Choose where to spend your time. If your chocolate cheesecake is a family favorite, make it with pride and let something else go or buy one this year. If you still need to buy gifts, have a plan before going online or heading to the mall. Think about what you want to give each person and make notes (remember to bring them with you). Not enough time to ship items? Buy online and pick up at the store. Tired of buying ties for your uncle and sweaters for your aunt? Give movie or theater tickets, restaurant or spa gift certificate, or favorite store gift card – and so easy to wrap! Use gift bags instead of wrapping presents. Toss in some pretty tissue paper and you’re done. After the holidays, inventory all decorations. Donate or toss those you no longer enjoy or don’t work. Store holiday decorations in labeled containers with labels facing you, not on top. As soon as the holidays are over, make notes about what went well and what you want to do differently next year. Put your notes with your holiday decorations. The holiday season should be full of fun and a time to enjoy the company of family and friends. 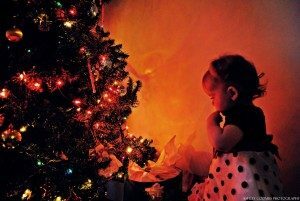 But if it’s usually a stressful time for you with too much to do and too little time, decide to get organized now and next year’s holiday season (and the rest of the year) will be a breeze! I guarantee it. 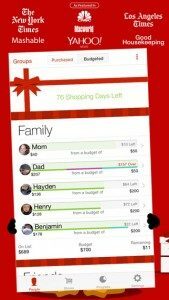 Organize your gift-giving and budget with this simple app. Christmas List has a great list display. The app shows how much money you spend v. your budget. See at a glance what you have bought, wrapped and sent. You can add gift recipients’ names directly from your contact list. You can share lists, print lists from the app and password-protect them in case you have nosy kids who can’t wait to see what they’re getting. The app is $1.99 for iOS devices. Click here for information or to buy. 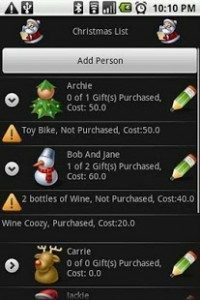 Similar to Christmas List, this app tracks gifts and budgets and offers password protection. You can share your lists on social media, by email or on Evernote. At the end of the season, archive your lists and start anew. Free for Android devices. Click here for information or to download.